Better known as the “Industrial Port City”, Batangas is one of the fastest growing economy in CALABARZON province-an export driven industrial development region that stimulated the growth of shipping activities in Batangas Port. Bordered by the Province of Cavite and Laguna to the north; Quezon Province to the east, crossing Verde Island Passage to the south is Mindoro, and to the west is the West Philippine Sea. It’s capital is Batangas City. Long before the arrival of the Spaniards in the country, large communities are already settled along the Pansipit River- a navigable channel (it used to be- that is before Taal volcano’s eruption in 18th century) connecting Taal Lake to Balayan Bay. These community have been engaging trades with Japanese during Muromachi period, and Chinese traders since the Ming Dynasty in the 13th and 15th century. The first Spanish missionaries arrived in 1572, later on in 1581 a settlement was established and named it “Batangan” because of the numerous big logs that were seen at Calumpang river. The logs by the way were named “batang” by people settled near the river, and later on the word batang were replaced and it became Batangas in 1601. On 21st of June 1969, the late President Ferdinand Marcos signed a law (Republic Act No. 5495) creating Batangas a City. On 23rd of July 1969, Batangas City government was formally established. Batangas City is approximately 112 kilometers southwest of Manila. Batangas Port (declared as a national port in 1956) on the other hand, is located in Barangay Sta. Clara, about two kilometers from the city proper; and situated in the northeastern part of Batangas bay, a strategic site for the development of port facilities. The bay area has a 180 square kilometers of body of sea while the mouth of the bay is approximately 16 kilometers across, and is well-protected by Mindoro, Maricaban Island, and Calumpan Peninsula. Batangas Bay has a steep underwater slope, thus for the most part the bay is calm and deep perfect for large ocean going vessel to anchor near the shoreline. This ISO 9001:2008 certified port was first constructed in the middle of 1930’s, its facilities were utilized as the entry/exit for people and products going to and from the Province of Mindoro, Marinduque, Romblon, and Palawan (MIMAROPA). More importantly, Port of Batangas served as the strategic shipping venue for all industries in the areas of Cavite, Laguna, Batangas, Rizal, and Quezon (CALABARZON-as it was popularly known). The port facilitates the transport link by land and sea routes using inter-modal buses, ro-ro/lo-lo vessels, motorized out-rigger boats, and mono-hauled/trimaran fastcraft (introduced in 1995) within the Ports of Calapan, Puerto Galera, and Abra de Ilog in Oriental Mindoro. It also links the west coast ports of San Jose and Sablayan in Occidental Mindoro, Ports in Sta. Cruz and Balanacan in the province of Mariduque, Port of Romblon and Odiongan; so does the Port of Coron in Busuanga Island, and major Ports in Cebu, Iloilo, and Cagayan de Oro as well. – Dumaguete City, Negros Oriental and Dapitan City, Zamboanga del Norte. Batangas Port started its roll on-roll off operation to Mindoro Province in 1981. And by 1994, the volume of sea-going passengers heading to Calapan, Puerto Galera, and Abra de ilog steadily increased due to influx of vacationers and local tourist during holidays and weekends to take advantage of beautiful sand beach, and breathtaking sceneries that offer leisure and relaxation. Passenger traffic among various shipping liner with connections to Mindoro’s west coast ports of San Jose and Sablayan, Romblon’s Odiongan and Tablas Port, so does Coron Port in Busuanga Island, have all been picking up its pace in succeeding years thus competing to giant inter-island shipping companies which offers Manila direct route. Due to the congestion and over-capacity of Port of Manila in the early years, government agency planners seek alternative ports to address these issues. A major opportunity for development of Batangas Port were then foreseen because of the fact that it sits on a strategic location-which is near proximity to the thriving economic zone of CALABARZON region, the Agri-Marine products of MIMAROPA, and the growing economies of the provinces in Vis-Min region. It has been established that vessels sailing from major ports of origin around the Visayas and Mindanao area, would likely save fuel and time if it chooses Batangas Port rather than the usual North or South Harbor as their port of destination, the reason behind it is because sailing to North harbor for example add six hours more; sailing in both the northward and southward direction will cost more fuel and precious time (approximately 12 hours turn around). Batangas Port then was once considered one of the two most underdeveloped ports in the country (the other is port of Cebu), and already struggling to accommodate rolling cargo traffic and large number of domestic vessels. Existing port facilities then are “cramped and dilapidated making orderly and efficient operation impossible” (5). The Port itself cannot meet the necessities needed for tourist/passenger’s convenience especially during peak season, thus contributed to the inefficiency in shipping services. The Port neither had any berth specifically built for ro-ro vessel, thus limiting ferry operators to three companies. It was customary then for a ferry vessel to remain at berth even past their scheduled departure time just waiting to fill all the vacant spaces with vehicles and passengers, forcing the next vessel in-line to wait for more hours for their turn. i). Improved the function as the access point to Mindoro Island: To promote the supplies and distribution of agricultural products from Mindoro to Southern Tagalog Region, thereby contributing to the development of Mindoro Island. ii). Function as a hub port contributing to the economic development of its hinterlands: To stimulate the regional economic development of the Southern Tagalog Region, the industrial heartland of the Philippines. (iii). Functions relating to the National Capital Region: As a second port to supplement Manila Port’s North and South harbor where traffic congestion is worsening. In 1984, the Batangas Port Expansion Program were formulated by the Philippine Government and Japanese International Cooperation Agency (JICA). On December of 1985, a feasibility study were conducted for the Development Project of Batangas Port (known as Batangas Port Study). It was initiated by Japan International Cooperation Agency (JICA), upon the request from Philippine government and it became the basis for a loan from Japan’s Overseas Economic Cooperation Fund (OECF) for the construction of Phases 1 and Phase 2 project. Within the feasibility study, the development plans were divided between short-term and long-term elements. Executive Order No. 385, issued by then former President Corazon Aquino on the 19th of December 1989 delineated the territorial jurisdiction of the Port of Batangas, an important moved to increased its land use for future expansion. But it also raises future tensions, problems, issues, resulting to court battles between affected land owners/settlers on the affected community, and government implementing agencies. Issues such as land ownership, forced-eviction, compensation, re-settlement, so on and so forth. Department of Transportation and Communication likewise were given a task to prepare a National Port Transport Plan to address regional development needs, and comply with the privatization program integrating an inter-modal transport network that would link road, rail, sea, and air transport systems efficiently. Executive Order Nos. 212, paves the way for the deregulation of all government ports in the country. Batangas Port Development Project (BPDP) of the Philippine Ports Authority was one of the major flagship programs of Philippines 2000, the development plan of then President Fidel Ramos Administration in its bid for a globally competitive economy. Pier II Length 48mtrs.Width 12mtrs.Depth 4mtrs. Pier III Length 85mtrs.Width 15mtrs.Depth 2.67mtrs. Parallel wharves Length 93mtr.Width 15mtrs.Depth 7.5mtrs. Cramped and crowded with vehicles,passengers and cargo. and two berthing facilities for cargo vessels of 200 meters in length. Three fully Air-conditioned Passenger Terminal Buildings (PTB’s) capable of handling three million embarking passengers annually. A range of modern cargo handling equipment including quay cranes and forklifts are available. A computerized cargo tracking system is also being used. It has a total land area of 206,349 square meters. For passenger safety, vessel security, and traffic monitoring along the harbor, baseport Batangas installed a total port security system; this includes vessel traffic management system or VTMS (manned by coast guard personnel). Crowd monitoring system, Gate management system, Mobile x-ray scanning machine, and Harbor patrol craft. Batangas Port Development Plan Phase II project represent the long-term plan for Batangas Port. Costing three billion pesos, it sits on 128 hectare expanded area specifically built for large-scale cargo handling, with capacity to handle foreign/domestic cargoes at 4.34 million tons per year (in 2005); to which it could promote its functions as a supplementary port for Manila. It was planned to serve not only the Visayas-Mindanao region, but design to meet the demands of growing trade, and commerce between the countries in the ASEAN region. The Phase II loan agreement was signed on March 1997; assisted by five and a half billion pesos loan grant from Japan Bank of International Cooperation (JBIC). It was inaugurated on January 19, 2008, two months ahead of the scheduled completion. Package 1 are civil and marine works; it includes container terminal and handling equipment instillation (estimated cost of P1.06 billion), general cargo berth, dredging, and reclamation works, building construction and support facilities. One of five boarding bridges installed in Batangas Port. Package 2 on the other hand, are construction of five boarding bridges and elevated walkways were completed. Package 3, better known as Arterial Road Links Development Project is a port access and flyover construction. These includes the P1.5-billion Southern Tagalog Arterial Road (STAR) projects, and the South Luzon Expressway (SLEX) road widening and expansion project. Philippine Ports Authority (PPA) is a government-owned corporation attached to the Department of Transportation and Communication (DOTC). It was created by virtue of Presidential Decree (PD) No. 505 dated 11 July 1974, its functions are to coordinate, streamline, improve and optimize the planning, development, financing, construction, maintenance and operations of ports or port system in the country. Batangas Port is exclusively operated by Aries Arrastre Services Inc. (subsidiary of Asian Terminals Inc.) with the charges set by PPA, and a prescribed portion of the profits are paid to the PMO Batangas. 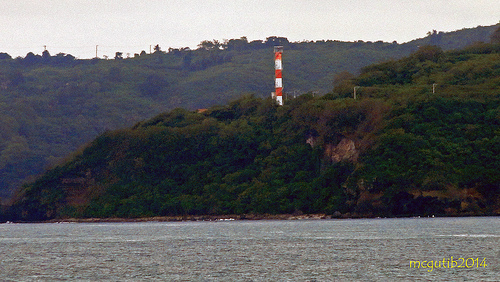 Navigational Approach: From the south, between Motoco Point and Malajibo manok Islands with an opening of 3 ½ miles, white flashing beacon on Malajibomanok Island Center, duration 0.3 seconds every 10 seconds visible within 8 miles in clear weather. Islands and point can be approached within ½ miles. Anchorage: The anchorage area is 0.37 km. from shoreline, southwest of the piers with depth of 27.4 to 32.9 meters mud bottom. During southwest monsoon, vessels may anchor off Mabini, Batangas. Good holding grounds off 0.46 km. from the shoreline, with depths of 21.9 to 25.6m. Foreign vessels find good anchorage area southwest of the piers. Batangas to Cebu- approximately 303 nautical miles. 4. Nathan Associates Inc. 1994. Liner Shipping Route Study, Final Report, vols. 1 and 14. Manila: United States Agency for International Development. 6. Myrna S. Austria, 2003. Liberalization and Deregulation in the Domestic Shipping Industry: Effects on Competition and Market Structure.